The first time I saw a rabbit being spun, it was in molt, sitting quietly in the lady’s lap. She had her little spinning wheel at the rabbit show and was drawing a strand of fiber from the bunny and spinning. Just like that. And it looked so very easy the way she was doing it. Angora is from a rabbit. Mohair is from an Angora Goat! Don’t get confused here. So this little white Angora rabbit was sitting in the lady’s lap and seeming not to mind that he was loosing all his fur to the spinning wheel. Since most show rabbits are groomed daily, this bunny didn’t have any knots or mats in his fur and it was easy for her to draw off the loose fibers into her spinning. A friend of mine had some Angora bunny fur from her rabbit in a gallon pickle jar in the fridge. 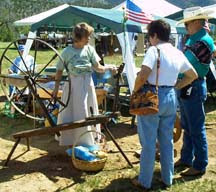 She brought it to a show where we were demonstrating spinning and weaving. She wanted to use my carding machine to comb this stuff out. Total failure!! This fur was so very fine that my carder drums were way too coarse to comb it. We tried blending it with wool, silk, and in desperation with some Pima cotton. It still wouldn’t blend, comb, nothing. It was clumped on the carder drum just as nastily as it was in the jar. I tried hand picking it out, I tried flicking it and then trying to spin it. Nothing was working with this Angora fiber.. Spinning was just a series of clumps, not the smooth thread she wanted for trimming a sweater. A couple of mistakes she made were: 1. she didn’t have time to daily groom this bunny. That would have saved us a lot of time and cursing in trying to comb it, and 2. she clipped the fur off the bunny rather than combing it off or plucking it off. I have worked with some other bunny spinners since getting this fiber and it is much, much easier to deal with the Angora if the bunnies are combed or brushed at least once a week. Much care should be used in removing the fur from the rabbit. They do bite when hurt! Don’t try to pluck tight fur. Just take that which is loose and would shed off anyway. If the rabbit is groomed frequently it might be alright to shear them as with sheep. Take care not to let the Angora felt. It is too much trouble to card it back out. Don’t allow alfalfa and other feed stuffs to get in the fur. It doesn’t come out. Much less likely to come out of that than out of sheep’s wool and it won’t come out of that either. Angora bunnies should be housed in clean, comfortable hutches with air conditioning or fans in hot weather. Other rabbits can have their frozen water bottles, but the moisture from these makes the fur clump as if you deliberately felted it. Bunny fur must be spun very tightly as it is so very fine and very slick surfaced. It will fuzz out when washed and look like the bunny itself.